It's getting close to road trip season, but before you reach your desired destination, you should pump the breaks! 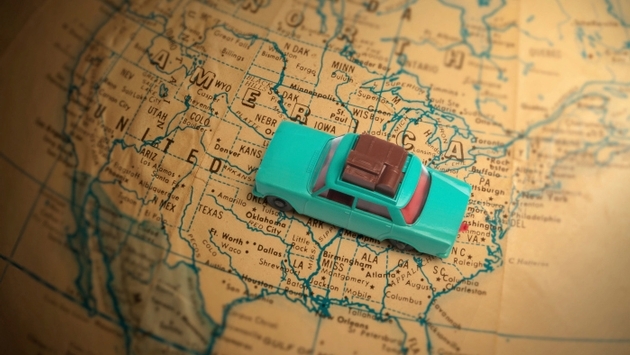 Not because the kids are screaming, it is time for a potty break, or you may just need to stretch your legs, but because the U.S. offers a wide collection of roadside attractions that are worth going out of your way for. From beer houses to terrifying dinosaurs, here are 10 roadside attractions for the true road warrior. Buckle up! Imagine taking a stroll down the street and seeing a family of life-sized statues glaring at you from a graveyard. Your first instinct may be to run, but should your curiosity get the better of you, step inside this peculiar site to get up close to the Wooldridge family and their two dogs Tow Head and Bob. Affectionately known as Uncle Henry, Henry Wooldridge was a prominent horse breeder in Mayfield who ordered the construction of these stone replicas of his brood, resembling the way pharaohs created life-like monuments of themselves to be remembered in life and after death. Along with his canine companions, you will see his mom, three sisters and three brothers, as well as two statues of Henry himself — one with the breeder atop a horse and the other standing next to a pedestal propping up a lectern. Ever wondered what to do with your beer cans after you have chugged the last gulp? Ever thought about siding your house with them? If so, A) you may have a problem, and B) someone already beat you to it. John Milkovish, a retired upholsterer for the Southern Pacific Railroad, began this strange new hobby after he “got sick of mowing the grass." He decided to add aluminum siding made from beer cans onto his house which resulted in a complete transformation to his pad. Almost every nook and cranny of the residence is filled with cans, whether hanging from the roof to filling in the holes of his fence. Do you know America has a fire hydrant standing at 40 feet tall? Try not to crash driving past this monolithic sculpture that weighs more than 670,000 pounds. Designed by the Blue Sky Gallery, it took about 75 people to create this impressive masterpiece that also includes a fountain pumping unimaginable amounts of water. So the next time you walk past a fire hydrant, just imagine one towering you at 40 feet tall, and you will never look at them the same again. When you live in Ohio, you can either try and fight off the farmer stereotypes or embrace them. Artist Malcolm Cochran chose the latter when, in 1994, he installed a massive art installation in a business park in Dublin, Ohio. 109 massive concrete ears of corn line the field in arrow-straight rows, prompting many a visitor to pause for a moment in silent reflection and ask, "why?" To which many locals reply, "beats me." Twine never looked as interesting as in Cawker City, home to the world’s largest ball of twine. What may seem a bit odd for the curious onlooker is actually a proud achievement for Frank Stoeber, who in 1953 preferred to roll bits of sisal twine than reusing it or throwing it away. You will be amazed by the community effort it took to preserve Stoeber’s legacy, which now stands at over 7,000,000 feet. So if you happen to be driving through Cawker City, make a detour to see one man’s obsession transform into one of the most unique attractions to ever grace the roadways in the U.S.
No visit to any roadside attraction would be complete without visiting the famous Cadillac Ranch. Strategically placed along Route 66, this artistic display of 10 colorfully spray painted Caddies nose-down into the earth and facing west with their tails fins high in the air, making this site completely noticeable for trekkers traveling the Mother Road. Created by the famous Ant Farm art group along with their silent partner Stanley Marsh 3, a trip to the this popular attraction will open your mind to the creativity of the group as the thick smell of paint continues to intoxicate the air profoundly. How amusing would it be to see an elephant tipsy while wearing huge glasses? Although the large animal does not appear drunk, the glasses are totally real even if the elephant is only surreal. 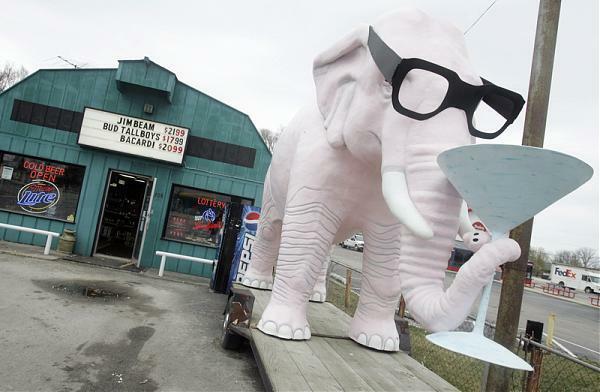 However, this odd site still packs a big punch, especially for the Wagon Wheel Liquor Store if you are in the mood for a drink or just particularly interested in seeing a pink elephant balancing a martini glass. Jurassic Park has made its way to California. At least it will feel that way once you set your eyes on Dinny, a massive Apatosaurus built with a souvenir ship in his belly, and a tyrannosaurus offering spectators the opportunity to slide down his back. Hollywood has come calling to the site several times, by featuring it in “Pee Wee’s Big Adventure” as well as Coke commercials. Regardless if you are in a hurry or not, you will be forced to stop and behold the grandeur of these colossal beauties, which are believed to be the largest dinosaurs in America. If you are familiar with Stonehenge, the famous stone monument in England, then you must see its offspring, Carhenge — a presentation of three circles of cars all painted gray, which appear more like a car sanctuary dedicated to the Roman sun god Sol by the way it gleams in the sunset. In actuality it was created by Jim Reinders, who dedicated this automobile conservation in honor of the death of his father. So, if you are looking for a mind-boggling attraction to set you on your way, Carhenge should be your next stop to roadside madness. No trip along North Dakota’s scenic Enchanted Highway should be traveled without a camera. And you will definitely see why once you catch the eye of the sculptures along this journey. From the 40 foot rooster of the ‘Pheasants of the Prairie’ to the 45 and 44 feet husband and wife of the ‘World largest Tin Family’, you will be amazed and afraid at the same time by these wide spectrum of scrap metal figures stretched along 32 miles of the highway. Not to worry, these giant sculptures are completely fake- well at least they pretend to be.